Doha, Qatar (4th September, 2012): 1001 Inventions, Qatar Shell and Qatar Museums Authority (QMA) announced today their partnership to bring to Doha two exhibitions about Muslim Heritage which celebrate the extraordinary and often-forgotten scientific and cultural achievements from the ‘Golden Age’ of Muslim Civilisation. The ground-breaking achievements of this era, from the seventh to the 17th centuries, will be introduced to residents and visitors to the Qatari capital from October 2012 until January 2013 through the internationally renowned and award-winning 1001 Inventions exhibition and the Arabick Roots exhibition, which premiered at the Royal Society in London in 2011. The 15-week celebration will feature interactive exhibitions, movies, live shows, cultural events and educational seminars. 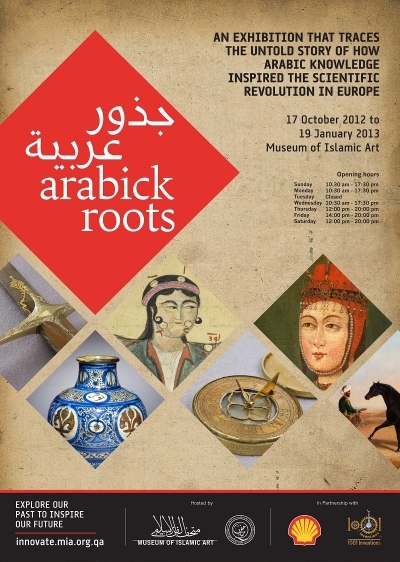 The exhibitions will be held at the Museum of Islamic Art (MIA) and are open to the public. 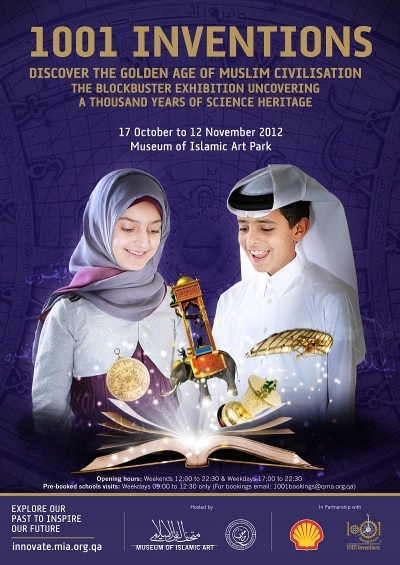 Situated in the Museum of Islamic Art Park, 1001 Inventions will open to the public on 16th October until 12th November 2012. The 1001 Inventions exhibition was named the Best Touring Exhibition of the Year at the Museums and Heritage Excellence Awards in 2011. 1001 Inventions exhibition reveals achievements of the golden age of Muslim Civilisation in an interactive, fun and family-friendly environment. It uses technology and interactive exhibits to relate stories of a thousand years of science using highly engaging interpretation. 1001 Inventions has drawn millions of visitors at blockbuster residencies in London, New York, Los Angeles, Istanbul and Washington, DC. Doha will also welcome the Arabick Roots exhibition, which was opened by Her Highness Sheikha Moza Bint Nasser, Chairperson of Qatar Foundation for Education, Science and Community Development, at its premiere last year at the Royal Society in London in partnership with the Foundation for Science Technology and Civilisation (FSTC, academic partner and parent entity of 1001 Inventions). 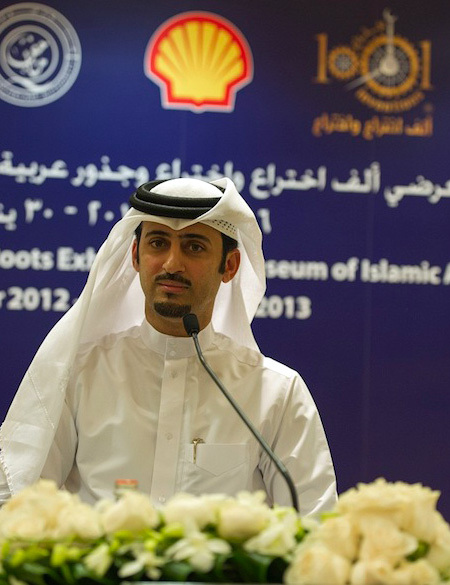 The Doha version of the exhibition, specially curated for the Doha audience through collaboration between 1001 Inventions and MIA, will be open to the public at the Museum of Islamic Art from 17th October 2012 to 19th January 2013. The exhibition will reveal rich and surprising connections between the scientific pioneers of Muslim Civilisation and 17th century Europe’s greatest scholars and scientists, showing that then – just like today – collaboration across linguistic and cultural boundaries can lead to great results. Wael Sawan, Qatar Shell’s Executive Vice President (on the right photo), expressed his enthusiasm for the two exhibitions, saying: “Shell is honoured to partner with QMA, MIA and 1001 Inventions to bring these two high-profile exhibitions to Qatar as part of our corporate social responsibility programme,” he continued. “In line with Shell’s support to the Qatar National Vision 2030, we are creating with our partners a series of cultural and educational events in Qatar during these next months. These initiatives aim to celebrate the towering achievements of the past to inspire the Qatari youth to create the innovations of the future, and build upon the existing accomplishments of this great nation,” he added. Doha will also play host to a range of events including inspirational educational films about the history of Muslim Civilisation, poetry readings, live shows and academic seminars to complement the exhibitions. Schoolteachers and parents from across Qatar will be invited to introduce the nation’s young people to the inspirational role models featured within the two exhibitions. This version of the 1001 Inventions exhibition was constructed with support from Abdul Latif Jameel Community Initiatives, the global partner for 1001 Inventions. Established in 2005 by His Highness the Emir, Sheikh Hamad Bin Khalifa Al Thani to combine the resources of all museums in the State of Qatar, Qatar Museums Authority (QMA) is a governmental organization whose remit is to develop museums and cultural institutions and provide an effective system for collecting, protecting, preserving and interpreting historic sites, monuments and artifacts. Under the leadership of its Chairperson H.E. Sheikha Al Mayassa, QMA is transforming the State of Qatar into a cultural hub of the Middle East. 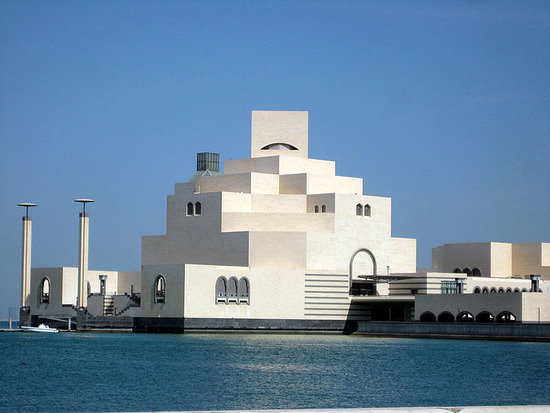 The Museum of Islamic Art, inaugurated in 2008, is the Authority’s flagship project. The organization won further global acclaim with the December 2010 opening of Mathaf: Arab Museum of Modern Art. QMA’s goal of becoming a “global leader in the world of museums, art and heritage” will be advanced in the coming years with ambitious, world-class projects, including the Jean Nouvel-designed National Museum of Qatar. For further information, please visit www.qma.org.qa. Shell is the largest foreign investor in Qatar investing up to $21 billion in the last 6 years. Qatar Petroleum and Shell delivered two of the largest energy projects in the world in Ras Laffan Industrial City. Pearl Gas to Liquids (GTL) is the world’s largest GTL plant and cements Qatar’s position as the GTL capital of the world. At an investment of $ 18 – 19 billion it is the largest single investment in the Shell Group’s global portfolio. The Qatargas 4 Liquefied Natural Gas project (QP (70%) and Shell (30%)) combines Shell’s global leadership in LNG with Qatar’s position as the world’s largest LNG supplier. Shell has established a world-class research and development facility and a learning centre, the Qatar Shell Research & Technology Centre, at the Qatar Science & Technology Park. Shell has a financial commitment to invest up to $100 million on programmes at the Centre over a 10-year period. In 2010, Shell and PetroChina signed an agreement with QP to explore in the pre-Khuff interval in Block D. In December 2011 Shell and QP signed a HOA to jointly develop a world-class petrochemicals complex in Ras Laffan Industrial City. One of the four pillars of Qatar National Vision 2030 and the National Development Strategy 2011-2016 is Social Development which includes cultural & educational themes. In line with this and as part of Shell’s corporate social responsibility programme, Qatar shell is bring the 1001 Inventions Exhibition and Arabick Roots exhibition to Doha in partnership with QMA, MIA and 1001 Inventions. For further information, please visit www.shell.com.qa. 1001 Inventions is a leading and award-winning international science and cultural heritage brand reaching over 50 million people around the world. 1001 Inventions, in partnership with Abdul Latif Jameel Community Initiatives (ALJCI), have produced a world-class range of exciting and engaging educational experiences, productions, products and resources that are all extensively researched by academics and experts from the UK-based Foundation for Science, Technology and Civilisation (FSTC).